Microscope slides by Johannes Grönland are always botanical, and are frequently still in excellent condition (Figure 1). Despite the Germanic name of the preparer, the specimen descriptions are hand written in French, with typeset labels reading “d’Anatomie a de Morphologie Végetales – Paris”. Occasionally, a slide is encountered with Grönland’s Paris address of 13 Rue des Boulangers. All of the Grönland labels with which I am familiar are bordered by a repeating “X” pattern, essentially identical to that seen on ca. 1860s slides by Joseph Bourgogne and H. Bourgogne (Figure 2). I have not located any evidence for collaborations between Grönland and the Bourgogne family, so the similarities of the labels may simply be due to their use of the same Parisian printer. Grönland was German by birth, but spent nearly 20 years in Paris, working as a highly regarded botanist whose research emphasized mosses and lichens. His microscope slides date from approximately the 1860s, possibly as late as 1871, based upon a published advertisement and the date he left France (Figure 3). Grönland published several papers on botanical subjects, and was the primary author of a major textbook on preparing botanical specimens for the microscope (Figure 4). That book was published after Grönland emigrated back to Germany in 1872, in the aftermath of the Franco-Prussian War. Figure 1. Examples of microscope slides prepared by Johannes Grönland, circa 1860s. Being a botanist, all his known slides are of plant material, both cut sections of larger plant material and whole pieces of mosses, lichens and such. Typeset labels that give Grönland’s address of 13 Rue des Boulangers are relatively scarce. Figure 2. 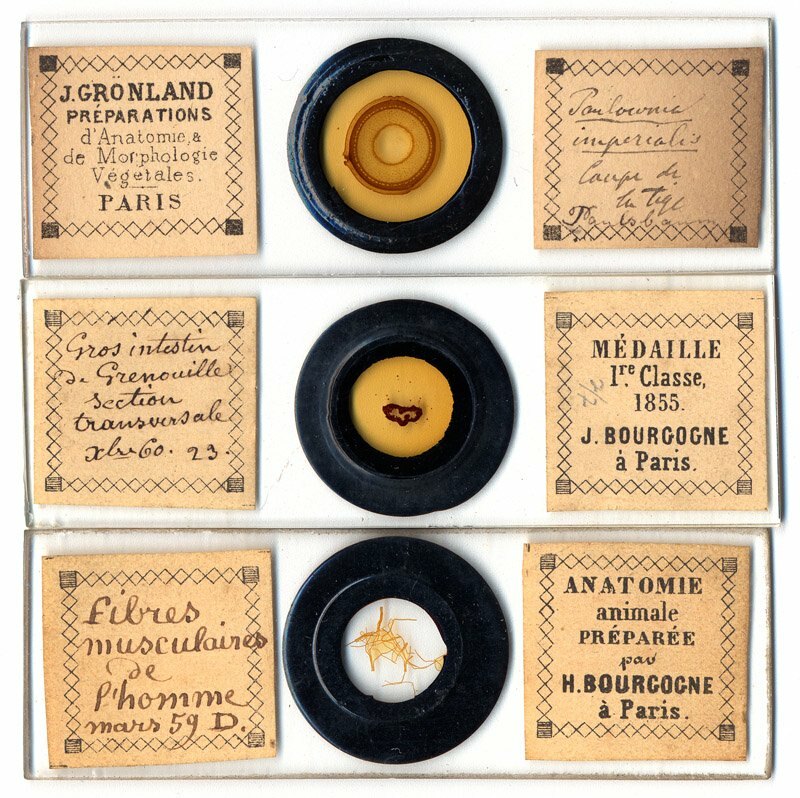 The microscope slide labels used by Johannes Grönland are nearly identical to those used by Joseph and “H” Bourgogne. There is not, however, any direct evidence of collaborations between Grönland and the Bourgognes, so they may merely have used the same printer. Johannes Grönland was born April 8, 1824 in Altona, Holstein (now in the German state of Hamburg). His father, Johann Friedrich Grönland, was an organist and music teacher. The junior Grönland pursued an education in pharmacy, studying and practicing in Altona, Hamburg and Jena. In 1849 he joined the army for the first Schleswig-Holstein war, against Denmark (1848-1851). Grönland published, in 1851, results of his investigation on Zostera marina (a sea grass commonly known in English as eelgrass or seawrack). In 1853, he move to Paris, where he became assistant to Louis de Vilmorin (Pierre Louis François Lévêque de Vilmorin, 1816-1860). Through Vilmorin, Grönland established relationships with such notable botanists as Claude Gay (1800 -1873) and Joseph Decaisne (1807–1882). Grönland joined the Société Botanique de France in 1854. That same year he published in the Society’s Bulletin a paper on hybridization of Aegilops (goat grasses). In 1859, Grönland was elected to the Societe Imperiale et Centrale d’Horticulture. 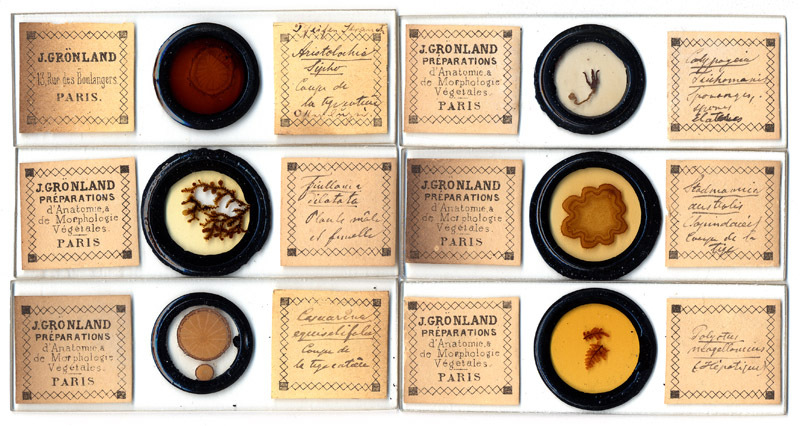 Grönland was commercially preparing microscope slides by the mid-1860s. A notice in an 1866 issue of the Bulletin de la Societe Botanique de France described a set of 15 microscope slides (Figure 3). 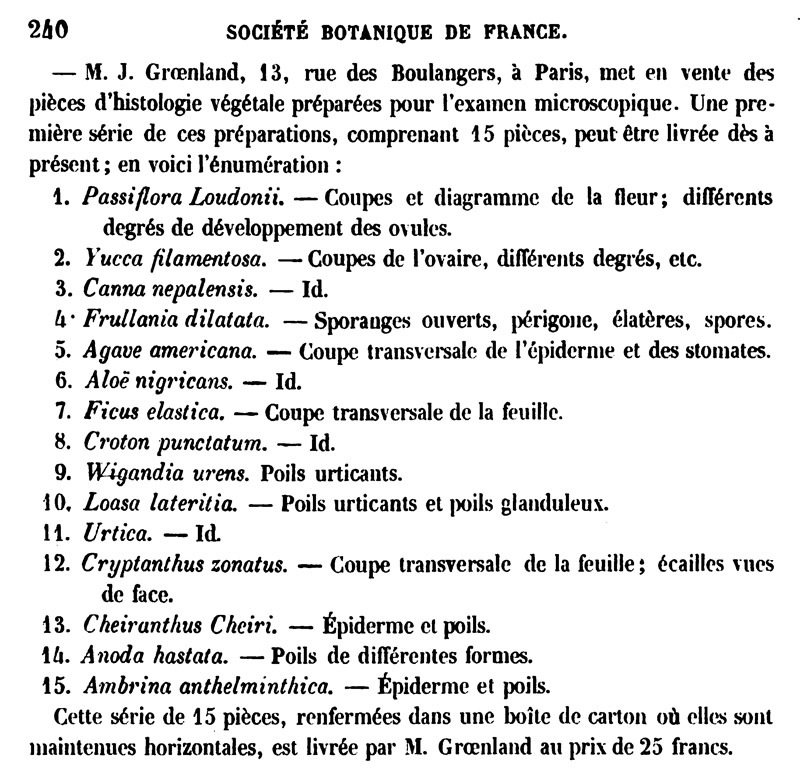 Among the many items displayed by Johannes Grönland at the First International Botanical Congress, held in Paris in 1867, was “une remarquable collection de ses propres préparations microscopiques”. Along with Maxime Cornu and Gabriel Rivet, Grönland wrote the book Des Préparations Microscopiques Tirées du Régne Végétal, a guide to slide-making with a strong emphasis on botanical preparations. It can nowadays be downloaded through Google Books. An English-language review in Nature had little good to say about the book, other than on some of Grönland, Cornu and Rivet’s tips for preparing plant matter. Most notably, the reviewer thought that microtomes were worthless, “they are, no doubt, very useful; but excellent sections are habitually made by those who use no contrivance of any kind. Imbedding in stearine is recommended in the case of Rivet's most ingenious section cutter; but when this is done it will be found that, with a little practice, the instrument can be quite dispensed with. It will hardly be worth while, therefore, for any one who wishes seriously to work at vegetable histology to expend 28 fr. upon it”. Figure 4. Title page of Grönland, Cornu and Rivet’s 1872 book. The diagram is of a turntable that can be fitted with a diamond, for cutting glass cover slips or cells, or with a brush, for applying glue to attach round cover slips, or enamel paint for applying ringing. The Franco-Prussian War broke out in July 1870, lasting until May 1871. Grönland was unable to leave Paris due to his wife’s illness, and so had to withstand the Siege of Paris (September 19, 1870 – January 28, 1871). The Grönlands left Paris after the war was over. It appears that his son(?) remained in Paris, as a “Jean Grönland” was married in Paris on October 18, 1872. Johannes then worked at the Agricultural School and Agricultural Chemistry Research Station at Dahme, Germany, until his death. He continued to publish on aspects of botany and microscopy. 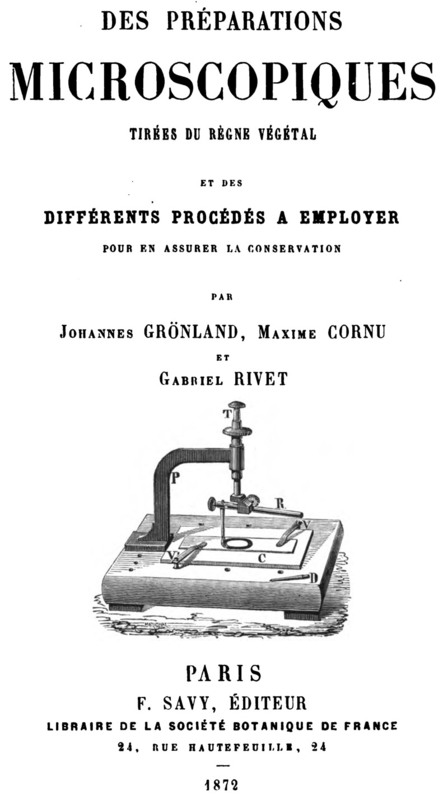 Despite the Nature reviewer’s dismissal of the microtome as unnecessary, Grönberg wrote an extensive paper on the use of Rivet’s microtome, in 1873. It was translated from German and published in the English Mechanic and World of Science in 1878. Johannes Grönland died in Dahme on February 13, 1891.